Vintage wines of the year 2001. The classic red wines of 2001 - the Grand Crus, the most famous wine estates and vineyards of Bordeaux, Burgundy, Piemont and Tuscany. 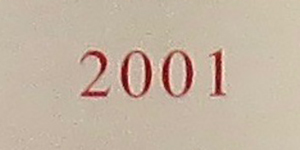 All the wines of 2001 have optimal level, color, label and cork. The bottles are stored in ideal temperature and controlled conditions.